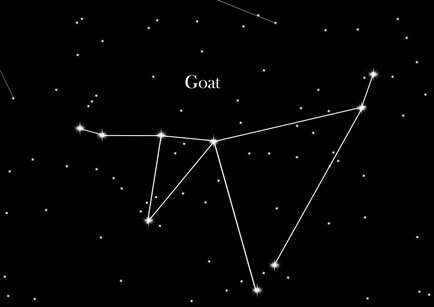 Capricorn is one of the oldest known constellations. It lies on the ecliptic line and is one of the 12 zodiac signs. The ancient Babylonians called this constellation the "Goat Fish" due to its shape. The new name of Capricorn was invented by the Romans. The Capricorn has a special importance as a zodiac sign in regards to astrology. All in all, the Capricorn is a rather discreet constellation as only two of its stars are brighter than the size class 3. The easiest way to find the constellation of Capricorn is to search for the bright stars of the "Southern Fish" and for the Altair in the constellation of "Eagle". Once you find them, imagine a line between them - right below this imaginary line, you will see the constellation Capricorn. Today's Capricorn is an extraordinary hybrid, which consists of goat and fish, whose origin dates back to the time of the Gigantomachy. In those times, during one battle, the Olympian gods took flight from the giants and turned into animals to camouflage themselves. This way, Zeus’ wife Hera turned into a white cow and Zeus himself into a sheep. Solitary, just like he was, improved the god of shepherds Pan his cover and transformed himself at the same time into two half- animals: the upper half was turned into a goat, and the bottom one into a fish. From that fact stems the old mythological name ""goat fish"" that shapes today's constellation Capricorn. Astrological significance: People, who are born under the sign of Capricorn, are regarded as dutiful and serious. With their diligence and their sense of reality they often come across as “hard” people. Behind their tough exterior, however, there's often a very sensitive and warm person. The element of Capricorn is the earth.